TSATD 2.0 continues the story of the survivors of the numerous mass extinction events as the winter turns to spring and life attempts to carry on. 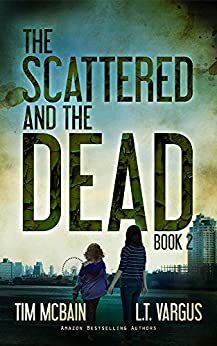 The main focus of this book is on Erin and Izzy, Ray, Lorraine and their encampment of survivors, and Decker, and Teddy in the most recent months after civilization ceased to exist. Baghead and Defino also continue to figure prominently in the future segments of the book. In this portion, we are also introduced to a new character: “The Father”, a mysterious, yet very powerful man who rules over a large post-apocalyptic settlement. I really had a hard time putting this one down and I loved how all of the storylines are starting to come together. The addition of “Squirrelman” in Erin and Izzy’s timeline was a nice change of pace and I loved seeing Erin struggle with having her authority threatened and tested. As the trio now set out for bigger and better places and stray closer and closer to the domain of Teddy the psychopath, I felt genuine anxiety for the group as I kept hoping that these paths would not cross. And speaking of crossing paths, our resident agoraphobic, Decker, who watched the end of the world from the seclusion of his apartment all those months ago has found himself right smack in the middle of the new settlement that is being nurtured by Ray and Lorraine. To see him struggle with daily human interaction and his attempts to fit in (or not) made for a good story. The future portions of the story set in the compound controlled by “The Father” I can only describe as “bleak”. Nine years after basically the end of the world, and people are still flocking to charismatic personalities like moths to a flame. For as advanced as these people were after basically losing everything, there was also a primitiveness to it all… very Jonestowny or Heaven’s Gateish. I would definitely recommend not reading this one until after TSATD 1.0 so that the storylines and events to date make sense but if you have the time and are so inclined I would also recommend reading the interim books (0.5 and 1.5). While not necessary to understand the dynamic of this world, these in between books have been instrumental in introducing new characters and providing a backstory to who they are and how they came to be in the world where we find them. About 90% in, I had developed a few theories about what was going to transpire in the closing chapters of the book. While I was sort of correct on one account, I was completely wrong on the other. This provided a twist that I had not even seen coming and… it completely knocked my socks off! Now I start my long wait until the next installment to find out how the current and future survivors are faring.